Yeah, but: It's the dirty story of a dirty man. The Long Version: John Sandford, née John Camp, is a prolific author of crime fiction novels. The total's around thirty so far, with another coming out this month, and by my count I've read about two-thirds of them. 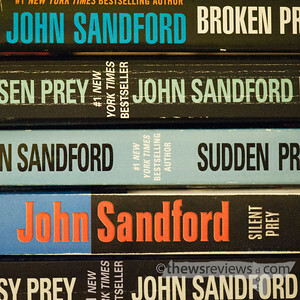 Sandford's main franchise is his 'Prey' series, which features Lucas Davenport as a Minneapolis-based cop, although his territory and precise job changes over time. But yet these aren't police procedural books, and there's almost a movie-star aspect to Davenport that's there to keep him interesting. There's also a strong cast of supporting characters, including Virgil Flowers, who has earned several books in his own right. And maybe it's just me, but I do find many of the character's names a little implausible - Del Capslock is my favourite, as he's named from a keyboard. I'm hoping that one day he'll meet his arch-enemy, Tab Runstop, and they'll have their final showdown in the small town of Dvorak, MN. But I digress. While I have read one of the Kidd series, I have to confess that I don't find it as compelling as the Prey novels or the Flowers series. I feel like I should make more of an effort with them, since it seems like they're ones that Camp really likes, but I've never quite managed it. They're as well-written as his other works, which is no small praise, but I just don't find the characters as interesting. "Yes," he said to the Barista, snapping out of his reverie. "That's enough whipped cream." I've been reading Sandford's novels in no particular order. His characters do change over time, and yes, the books do occasionally make brief reference to things that happened in the past, but it's a little like watching "Law and Order" in re-runs. The stories are compelling and mostly self-contained, with just a few villains that get carried over from one to the next. While I wish I had met Clara Rinker and Mallard-like-the-duck in their first appearance, I still found Mortal Prey quite compelling. I've just gotten into the habit of checking the publication date to see if Lucas is single or married, and I never feel like I can't follow what's going on. John Camp has worked for many years as a journalist - worth reading in its own right - and his novels benefit tremendously from it. 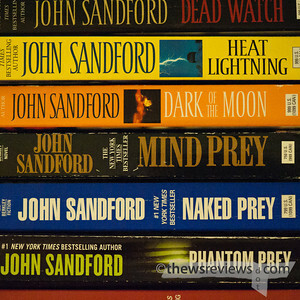 Another nice thing about John Sandford's novels is that he's a photographer. He doesn't go overboard, and can go entire novels without mentioning a camera, but when he does he knows what he's talking about. He also skips the "CSI" effect where anyone with a camera is an unspeakable evildoer. It's a nice change. 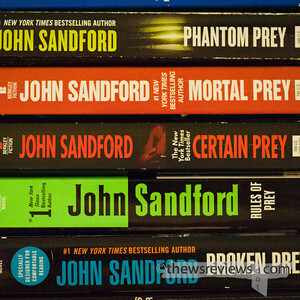 My one complaint: I wish that more of the Prey novels ended in an arrest. What can I say? I'm Canadian. As part of my research for this review, I asked Penny to pick one of the Prey novels to read. We've never liked the same books before, and I was trying to find out if these novels would have a broader appeal. Well, it worked. We've expanded our collection to include all of the Prey and Flowers novels that are in paperback, as well as the one-off "Dead Watch". That's twenty-three books in total, and she went through them all in less than three months. She had finished "Winter Prey", our most recent addition, less than 24h after I brought it home from the book store. It's hard to find a stronger endorsement than that. I was also inspired to re-read the collection in order, and I do have to say that they are better in sequence. The don't lose any on their own, so I would still endorse just picking up whichever one's closest, but as a series they gain from continuity. If you own the books, you might as well re-read them. I thought I was being subtle by not going with the chorus on that one. Instead, it lasted about thirty seconds. Not bad.